1. Use a special tool set into the shell metal nails, gently pull, you can separate the cover and the lower cover;Warning: The yo-yos is running fast, suit for kids more than 3 years of age.Do not violent to operat the gyroscope.Kids play need adult guidance and monitoring! 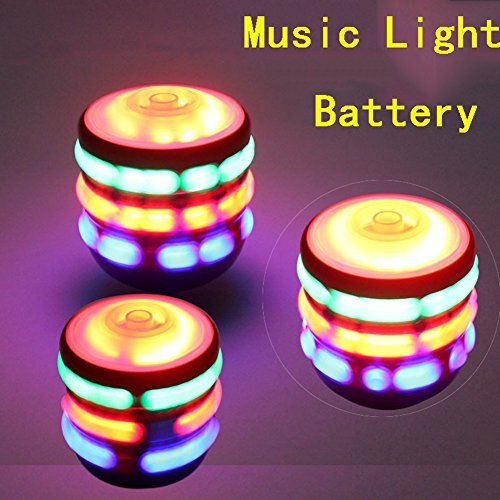 3 Pcs a set.The wheels rainbow light are lit when it's rotating/spining.Dazzling effect at night. Comes with a button battery.Great Christmas Halloween Gift for kids.Perfect for party favors,stocking stuffers,holiday. Rainbow gyroscopic spinning is amazing fun,challenge your children's imaginations and keep them active. Demonstrates centrifugal force and gravity-defying stunts to give your children/kid a fun science lesson. Comes in assorted bright colors. yo-yos toy for party favor.Kids play with other friends.